Earlier this week I attended the VMware vForum roadshow as it came to Melbourne for the first time. As part of the 10 year anniversary of vForum in Australia VMware have decided to bring the show on the road and do a whistle stop tour in each of the state capitals. This is a great idea. Even if it’s only a one day event and not the two-day event that normally takes place in Sydney it’s still good to have easy access to the event. The last vForum I went to was 2 years ago working with a vendor so it’s a different experience being on the opposite side and also getting the time to take in as many of the sessions as I could. Maybe it’s more experience and better knowledge on my part but I felt that I got far more out of the sessions at this vForum that any other conference/roadshow I’ve attend. Zettagrid have implemented it for their environment for exchange and have seen immense improvement. Netapp snapshots run 18x times faster than commvault for full and 12x faster for incremental. No need to do full scans of volumes before hand like commvault does. Has new cloud connect platform to backup over wan to cloud. Within cloud you can deploy veeam and quickly and easily restore back. They took out the numbers in the status badges as it was too confusing. 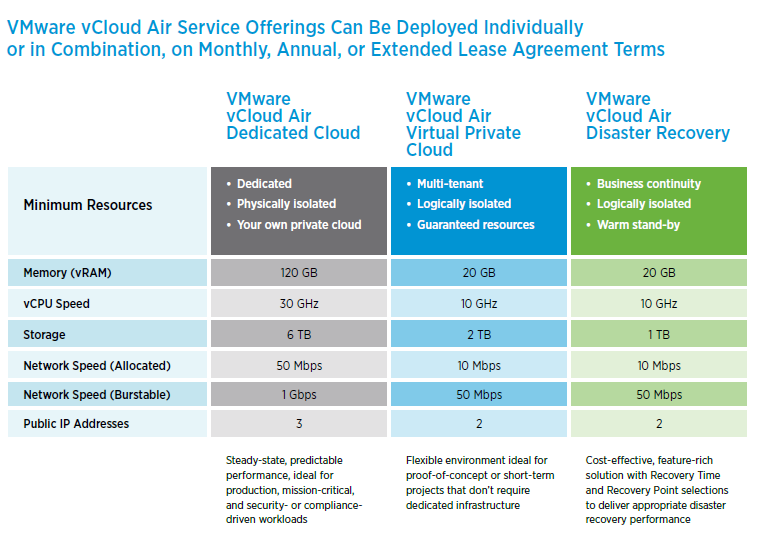 So vCloud Air. vCloud Air will utilise VMware vCloud Director to create multi-tenant environments with isolated resources. This will make it easier, and is VMware’s argument, to migrate to vCloud Air without having to change any configuration of the VM or the application, there’s no performance change on VMs when transferred to cloud. There’s also no need for the admins to learn new tools as vCloud Air is just an extension of their current VMWare environment. vCloud Air will run on ESXi just as your own production systems do. This is also where VMware differs from the other cloud providers. If you’re not running VMware then chances are you not going to be looking at vCloud Air as an option. As mentioned already it will be hosted by Telstra and it can be a dedicated cloud or virtual private cloud. There are also options to use just the Disaster Recovery option or just Desktop as a Service from vCloud Air. It runs on logically separated storage for the virtual private cloud. Everything is shared. If dedicated storage required a cross connect from Telstra colo required. vCloud Air will have 11 sites globally and will have HA built in. The migration options to vCloud Air are using OVF imports one at a time or offline transfer or to use vCloud connector to move VM or template one at a time, over https uploads via APIs. To me vCloud Air is promising and is a good first step from VMware. I’ve been researching a few other potential Cloud solutions over the past few weeks and it fits into a potential use case for us. There are other possiblities such as just using Amazon or Azure, or even using NetApp Cloud OnTap in Amazon AWS or even other cloud providers such as AT&T, Telstra. And lets not forget Cisco InterCloud Fabric. I’ll try to review some of these in the coming weeks. vForum to me was a success and I hope that VMware follow a similar formula next year and bring vForum to the masses. This entry was posted in General, Veeam, VMware and tagged Community, vForum, vForum Melbourne, VMware. Bookmark the permalink.